Two of my favourite orchids, Dendrochilum parvulum* and Dendrochilum tenellum*, produce their flowers at this time. Although they may be grown in a shade-house in New South Wales, I grow mine with winter warmth and would not risk exposing them to frosty weather. 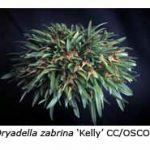 Dendrochilum parvulum is a miniature species only 50-60 mm tall, and a specimen plant may be accommodated in a 100 mm squat pot. 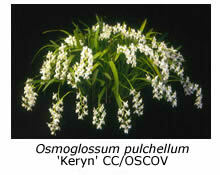 It is so prolific that the tiny white flowers obscure the plant at flowering time. 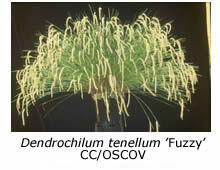 Dendrochilum tenellum is much taller than Dendrochilum parvulum, but its cylindrical leaves are much narrower, being only 1-2 mm in diameter. The arching inflorescences, although only about 50 mm long, each carry 40 flowers. Last year my plant carried 500 inflorescences and 20, 000 flowers – a highlight of my orchid year. Dryadella zebrina* is another miniature species with leaves less than 50 mm long. The tiny flowers appear in August and September but are so well camouflaged that it is easy to miss them among the foliage. 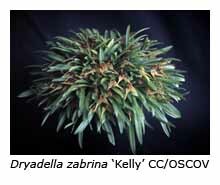 For this reason this species has been given the common name of the ‘partridge-in-the-grass’ orchid! This and the similar D. edwallii are grown more for their curiosity value than for the ‘grandeur’ of their floral display. Although I grow most of my masdevallia species and hybrids in a shade house, I advise you to provide your plants of Masdevallia tovarensis* with winter warmth, as they seem to be less tolerant of frost than most masdevallias. Each flowering stem supports several glistening white flowers in July and August. Well-grown plants may carry as many as five flowers per stem, which should not be removed when the flowers have fallen from it, as it will probably flower again the following season. The majority of oncidiums have yellow or brown flowers but Oncidium ornithorhynchum differs in producing branched inflorescences of small pink blooms. Unlike many other oncidiums, it needs to be kept moist throughout the year, which means watering it weekly in winter, and every day or two in summer. A hanging pot displays its semi-pendulous, extensively branched inflorescences to best advantage. Although there are seven species in the genus, Osmoglossum pulchellum is by far the most common in Melbourne. All have white flowers, some with a tinge of purple. 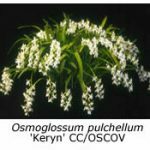 Those of O. pulchellum are glistening white, long lasting and fragrant, the perfume being reminiscent of lily-of-the-valley flowers. The clustered, furrowed pseudo-bulbs carry a number of narrow, glossy green leaves about 300 mm tall, while the taller inflorescences bear up to ten flowers that usually open in late winter or early spring. In my experience, O. pulchellum resents re-potting, which should be carried out only when the plant begins to show signs of distress. My preferred potting medium is a mix of pine bark and Sphagnum moss but some growers use bark alone. The rationale for adding moss is that this species, like the odontoglossum alliance in general, likes to be kept moist at all times. My plants are grown in a shady spot on the lower tier of my cymbidium house. 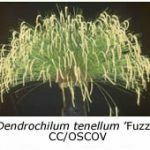 Unfortunately, O. pulchellum flowers are especially prone to attack by the fungus Botrytis cinerea, which rapidly disfigures them with grey or brown spots. To minimise infection, its flowers should never be sprayed with water, and to ensure freedom from spotting I find it best to move flowering plants indoors to a dry atmosphere.